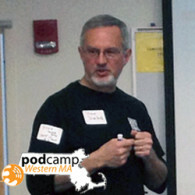 Stephen Sherlock’s presentation on blogging 101 at PodCamp Western Mass 2013 was interesting and informative. This was a great presentation in the traditional podcamp style – 15 minutes or so of a formal presentation and lots of great interaction and questions for the rest of the session. Stephen refers to the 3 pillars of blogging, content,conversation and community. Before starting to blog you need to decide what you are going to blog about and what audience (community) you want to reach and have a conversation with. He did a great job explaining this with concrete examples of his personal blogging experiences.